The under-13 county final took place today in Cashel. The team had been training hard and won some good matches on the way to the final. 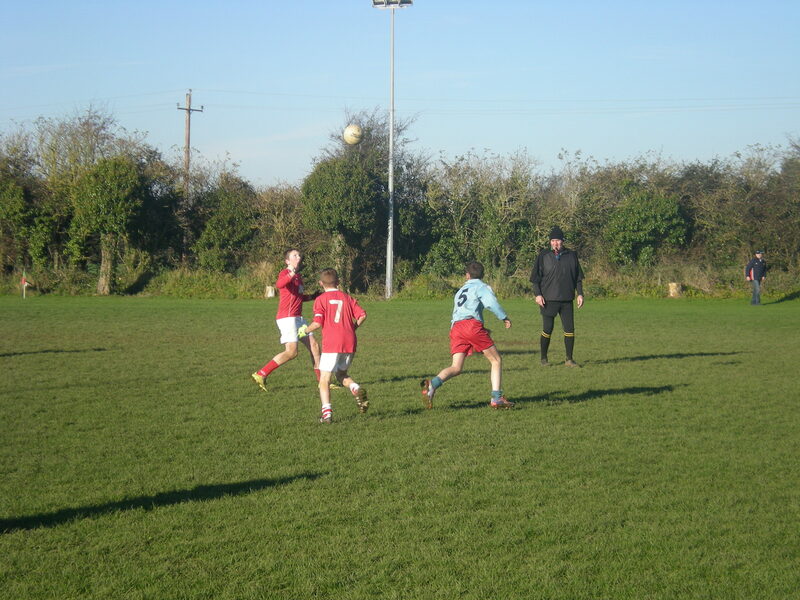 However Ballyneale were beaten by Rosegreen, in what was a very physical game. 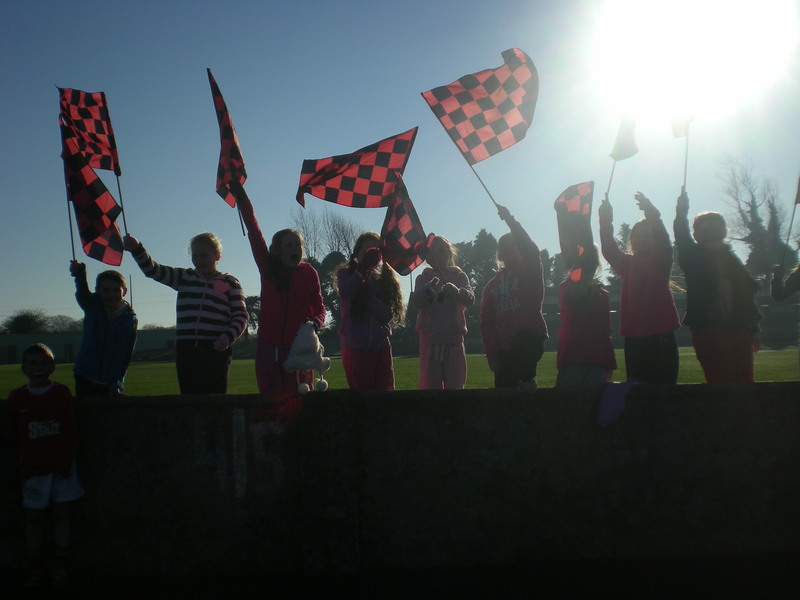 They had some fantastic support on the day from the Ballyneale N.S supporters. Congratulations to Rosegreen and to Ballyneale’s under-13 team for getting so far in the competition. The Senior Classes are going on a winter school trip this year on Tuesday the 9th of December. Pupils are heading to the R.D.S. in Dublin to enjoy a Christmas Circus, Ice-Skating and Funderland. The bus departs at 9 a.m for Dublin and returns at 9 p.m that evening. 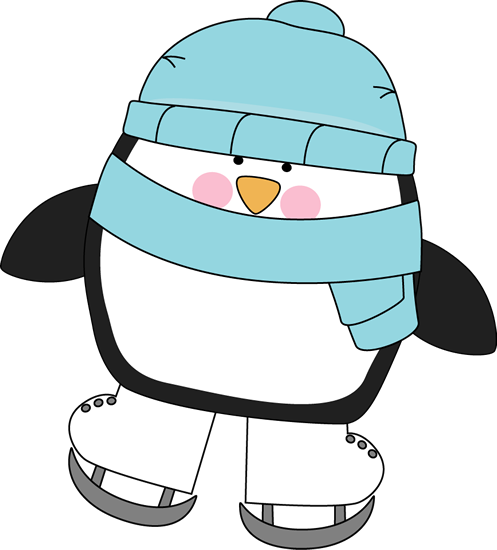 Pupils need to bring two packed lunches, a warm jumper and coat. 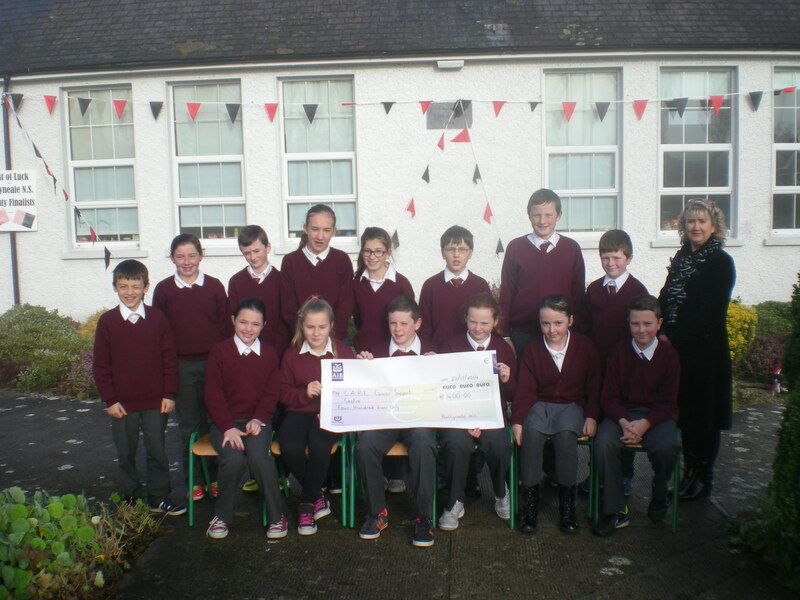 5th and 6th Class presenting a cheque for E400 to Ann Kennedy from C.A.R.E Cancer Support Centre for South Tipperary. The boys and girls of the student council (seated) organised a cake sale to raise funds for the centre and the Irish Cancer Society’s breast awareness campaign (Paint it Pink.) The Student Council are looking forward to the next event they can organise already! 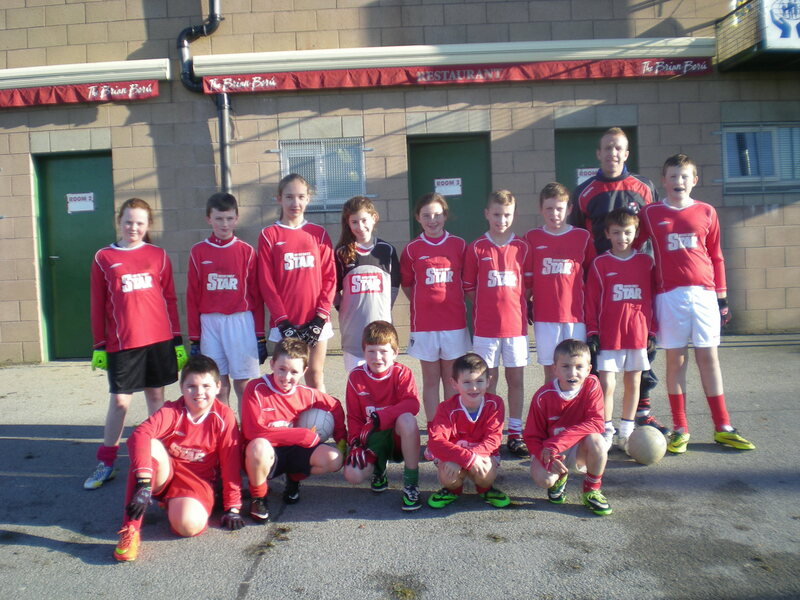 The Under-13 County Final between Ballyneale and Rosegreen takes place next Wednesday the 26th November at 11.40 a.m. The venue is Leahy Park in Cashel. Best of luck Ballyneale!! Today we raised our second Green Flag for energy awareness. 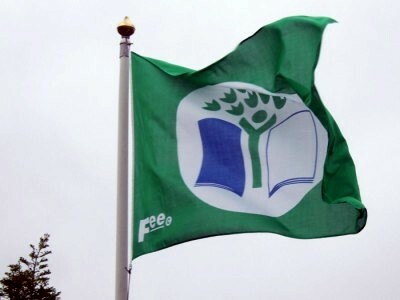 Ms. Dempsey and the Green School Committee spoke to staff, parents, pupils and members of the community about the Green School initiative and how we as a school worked towards achieving this flag. After the raising of the flag, parents were invited to teas and coffees in the staffroom. Thank you to all those who supported today’s event. 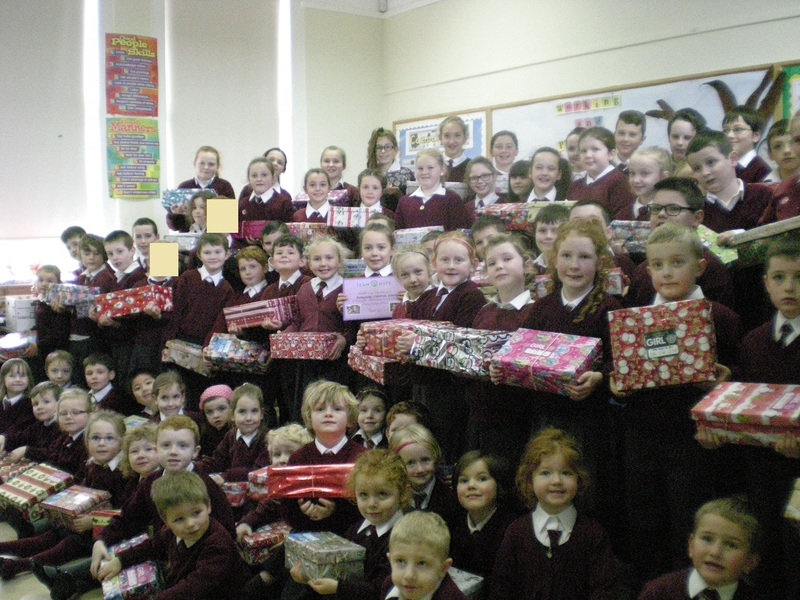 All shoeboxes were collected today from the school and will be opened by kids this Christmas in Kosovo and Ukraine. Thank you for your kindness and making this Christmas special for some lucky boy or girl. 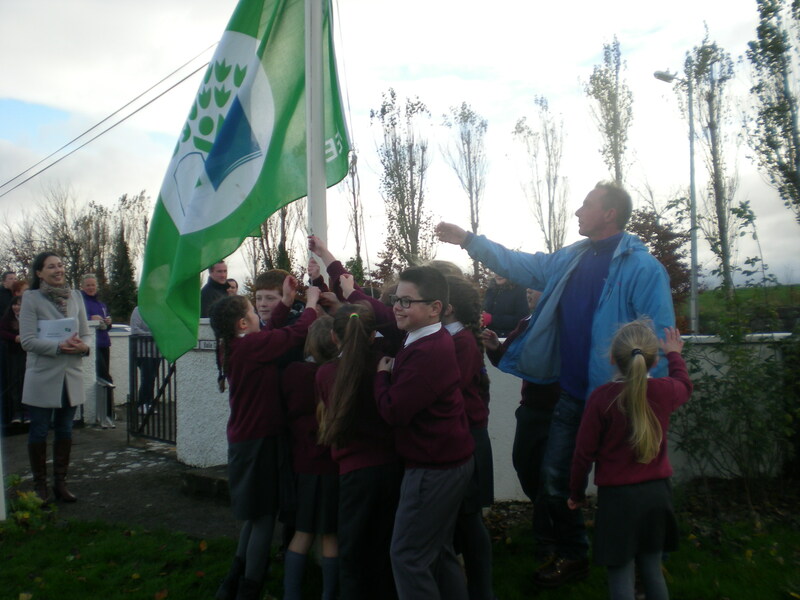 We are having our green flag raising ceremony this Monday the 17th November at 1.10 p.m. Please come along and join us for this momentous occasion. There will be tea and cake provided by the Parents Association afterwards in the staffroom. 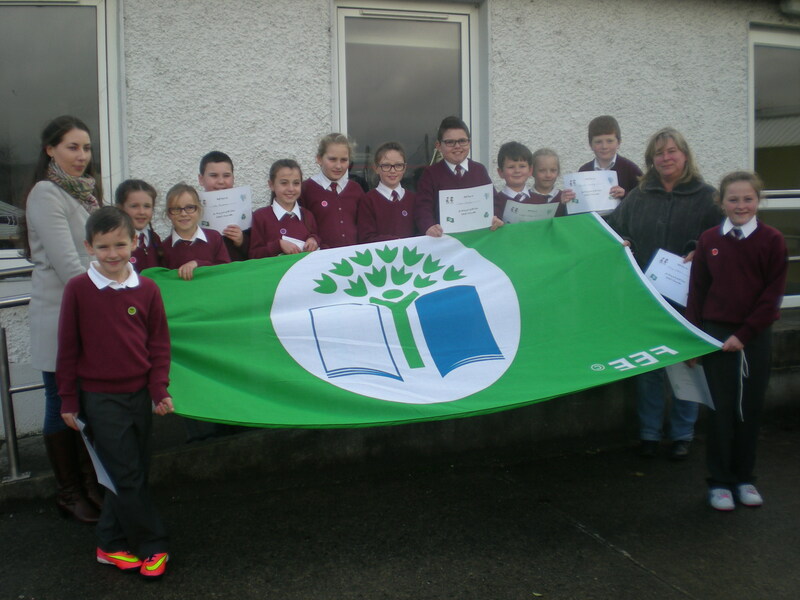 A big thank you to the Green Schools Committee and to teacher Clare Dempsey for all their hard work.